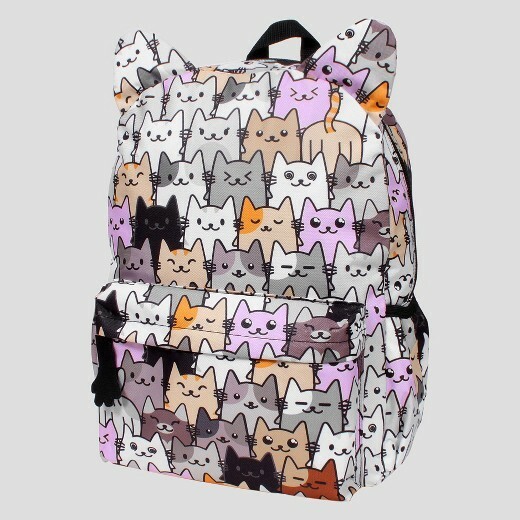 …a girl’s cartoon-kitten back pack. I laughed. I could already see the bullies of the school lining up to take shots at him. This wasn’t going to be pretty. We struck a deal, minus the “spit-in-the-hand” handshake, and moved on. Oh, here we go, Lord. Please don’t let anyone make fun of him! He marched right into that first day of school without a lick of doubt. He loved that kitty back pack and no one was going to convince him otherwise. Guess what? Everyone loved his kitties. If there was an unkind word spoken, I wouldn’t have known, and he probably didn’t care. Ah, to have the confidence of a nine-year-old boy convinced the world loves him! How can we learn to forget everyone’s opinions and embrace who we are, without question? What do you love? What do you dislike? What music sets your soul on fire? What passions would you pursue if no one were there to judge? It is difficult to be confident when you question. Try something on for size. Does it feel like you? Look like you? Move your spirit? Then don’t second guess yourself all day- own it! Look back on how it made you feel and you can decide then if it is truly “you” or not! Know how to be humble. Humility is not the opposite of confidence, as some would have you believe. You can be humble and confident simultaneously! Jesus was. The Bible tells us He was humble in spirit (Matthew 11:29), yet I never saw him back down from a pharisee that challenged a decision he made or who He was as man and God. You can be YOU in the face of judgement and criticism. Knowing who you are and whose you are is not conceit- it’s confidence! Knowing who you are and whose you are is not conceit- it’s confidence! Don’t be swayed by other’s opinions. Opinions are defined as a “view or judgement formed about something, not necessarily based on fact or knowledge.” The very core of someone’s thoughts about your clothes, your job, your marriage are based on what? Their emotions that day? Their past prejudices? Their current personal situations? Who knows?! Why in the world would we let opinions shape who we are and how we view ourselves? Those that are closest to you and love you the most should be the only words you let into your heart. Ignore the whispers behind your back, once and for all. Just like Tristan, my prayer is that you never back down from who you are; that you never march to the beat of someone else’s drum; that your heart isn’t swayed by society. What are you second-guessing today? What are you apprehensive to achieve because of others? Today, let’s stand on the truth of Christ, that we are handcrafted, beautifully and wonderfully made (Psalm 139:13-14) and no one can convince us otherwise. How have you struggled with self-confidence? Have you learned some of your own tricks to stay true to who you are? We’d love to hear your story! Comment below or share on FB. PS: Sign-ups for #theFives are open thru the 22nd! This is something that I’ve been breaking into over the last few years. I’ve always been such a people pleaser and all it has gotten me is depressed. Between my husband, MOPS, and #theFives I’ve been gaining the confidence to be me. God told me last session that I needed to love myself as much as he loved me and it hurt to hear that I wasn’t, but feeling like myself in my own skin makes me more of his child even if others look at my outward appearance and think otherwise. No more trying to fit into a mold that wasn’t specifically made for me. I couldn’t do it without God or my husband. So many bodily changes throughout the years and w 3 kids and although my view has wavered and distorted, neither God’s nor my husband’s view has changed at all. They have both been uplifting but I have only recently started hearing their affirmations. Honestly, my self-confidence lives in the gutter most of the time and has as far back as I can remember. I know it stems from past hurts and rejections. I try to focus on who God says I am rather than what the world wants me to believe, but it isn’t always easy. I’m thankful for the people God has put in my life that speak truth and life. It is hard to do most of the time, huh, Bianca? I love this! This is hard for me! I often do worry about what others think even if I know I shouldn’t. Several years ago, I challenged myself to read while I was walking in public because it was me when I was at home, and I figured I shouldn’t worry about what others think. It was hard to do, and I’m sure people thought I was weird, but I did it! ? Oh if only we could all have the confidence and self-knowledge that Tristan does! But as you say, I have found the more I seek Jesus, the more He has freed me to be stronger in these areas! Love this story! Sounds like you have an amazing son. I know I can learn from this! Thanks for sharing!